Yes its that time of year again time to get out the funny hat and long white beard and pretend to be granny!! 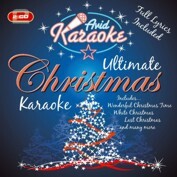 Seriously though folks, its the festive season and what better way to celebrate than with Karaoke market leaders AVID Entertainments latest release Ultimate Christmas Karaoke! This year we have a fantastic double CD packed with 32 all time classic Christmas pop songs from Lennon to Lake, from Crosby to Cliff, from The Pogues to The Pretenders and from Slade to Sinatra. This is the only Karaoke Christmas title (other than Christmas Carols AVC773!) you will need this year. Karaoke Christmas... Its what Christmas was invented for!